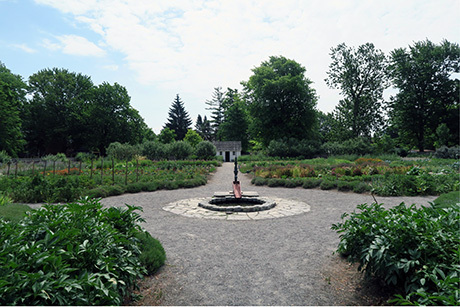 Restored kitchen garden at Hamilton's Dundurn Castle National Historic Site. Agnoletti, M. (edited by), The Conservation of Cultural Landscapes, CABI Publishing, 2006. Alanen, Arnold R. and Robert Z. Melnick, editors. Preserving Cultural Landscapes in America. Johns Hopkins University Press, 2000. Andrews, Thomas D. et.al, “Permafrost Thaw and Aboriginal Cultural Landscapes in the Gwich’in Region, Canada,” in APT Bulletin, Journal of Preservation Technology, 47:1, 2016, 15-22. Bluestone, Daniel. Building Landscape and Memory: Case Studies in Historic Preservation. W.W. Norton, New York, 2011. Connecting Practice Project: Final Report, IUCN, ICOMOS, The Christensen Fund, Swiss Confederation, Federal Agency for Nature Conservation, 2015. George Wright Forum. The Journal of the George Wright Society. Special issue: Landscape stewardship. New directions in conservation of nature and culture. Volume 17, No. 1, 2000. Longstreth, Richard, editor. Cultural Landscapes: Balancing Nature and Heritage in Preservation Practice. University of Minnesota. Minneapolis, 2008. Melnick, Robert Z. "Climate Change and Landscape Preservation: A Twenty-First-Century Conundrum." APT Bulletin 40, no. 3/4 (2009): 35-42. Mitchell, Nora and Robert Z. Melnick, “Shifting Paradigms: New directions in cultural landscape conservation for a twenty-first-century America,” in Managing Cultural Landscapes, editors Ken Taylor and Jane L. Lennon, Routledge, New York, 2012, p 232-252. Rossler, M.: Applying authenticity to cultural landscapes. APT Bulletin, The Journal of Preservation Technology, Vol. XXXIX, Number 2-3, 2008, 47-52. Taylor, Ken, editor. Conserving Cultural Landscapes: Challenges and New Directions. Australian National University, Australia; Archer St. Clair, Rutgers University, USA; and Nora J. Mitchell, University of Vermont, USA. Published as part of the series Routledge Studies in Heritage, 2014. Williams, Ron. Landscape Architecture in Canada. McGill University Press. Kingston/Montreal, 2014. The Government of Australia’s work on protecting Aboriginal landscapes, traditions and artifacts is of particular note. This background paper provides an excellent overview. Forestry and our Cultural Heritage. Proceedings of the Seminar 13-15 June 2005, Sunne Sweden. Joint FAO/FCE/ILO Experts Network to Implement Sustainable Forest Management. Swedish Forest Agency/Ministerial Conference on Forests Europe, Warsaw 2006. Brown, J., Mitchell, N., and Beresford, M. (eds. ), The Protected Landscape Approach: Linking Nature, Culture and Community. IUCN World Commission on Protected Areas, IUCN: Gland, Switzerland and Cambridge 2005. Association for Preservation Technology International Bulletin, Volume XLVII, No. 2-3, Special issue on cultural landscapes: A tribute to Susan Buggey, 2016. The Town of Caledon cultural landscape study has been well received and has influenced work done by other rural communities in southern Ontario.